So PBA Dragon - who's bowled on it, what did you see, like, dislike? If you haven't bowled on it but have some speculation, let me hear it. Going to bowl on it soon for a tournament. I've practiced on it. I used assymetric equipment; I didn't use a lot of surface. It seems to play to a medium scoring pace. I agree. Too many people use too much surface. It also depends on the lane surface and type of oil used. My son bowled on it in his summer youth league. It played lighter than one would expect. His best look came from his Ink. Started with his Alpha Crux, didn’t last but 5 frames, down to his IQ Tour solid. Switched to Ink near the start of game two. Wanted him to go there after a couple frames of the IQ. But let him live and learn. The league just bowled on it again this past Monday. He wasn’t there, we went to the baseball game. From what I hear, the kids kinda tore it up this time. Had to average over 200 to make cut. 240 avg led the way. Last time it was 180 cut, 200 led I believe. That’s what some of the bowlers relayed to my son Tuesday. Hmm maybe I'll do NRP and Phaze II @3000 and see which gives me the better look on fresh. 5 game sweeper so I figure the NRP or Code Black should let me follow the transition in. 45 foot pattern, not sure about the volume. I like strong pearls on this length pattern. Generally try to stay squared up, dont try to open up tje lane, even as you move in. 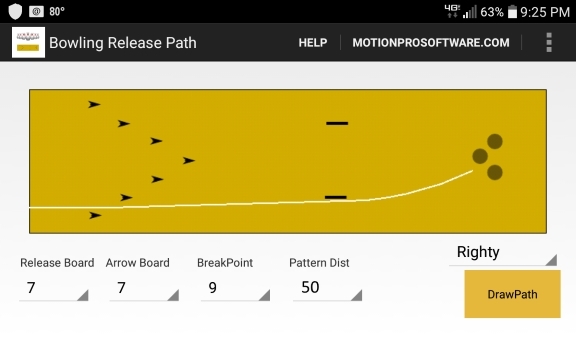 As with most patterns it is all about the transitions which will depend on how other bowlers elect to attack it. 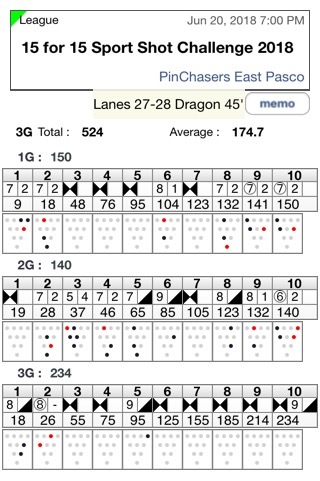 I bowled on the Dragon (45', Volume Oil Total:25.6 mL) last week. Third game I used a Pyramid Pathogen Plague a urethane ball (about 600 grit) and moved in slightly. I bowled on Dragon last week and found it to be super slick compared to other longish-type patterns such as WTBA London. I used a 1000-grit Sure Lock and played pretty much straight up 2nd arrow and did not get a lot of movement for 4 games (I was the only lefty on the pair). I also tried an Idol at 1000 that skated 60 feet to no success. We're bowling on it again tonight and I'm bringing the Sure Lock down to 500. There will be 2 other lefties (one 2 handed) on the pair tonight so I will have to be aware of transition. I will have the Idol at 1000 as a step down as well as a DDT at 1000. Not sure what you will get out of any of that as I am a speed dominant lefty. I do not know your rev rate but I would bring something with a little more surface than 3000, just in case you have room in the bag. Not saying you will use it, but why chance it if you have room in the bag? Gotcha - So I have the room, really just deciding which ball makes the most sense to have more surface for that purpose. Rev rate varies in the mid 300's with speed on the low side of 16. I thought about the IQ Tour at 2000 but that's probably no better than the Phaze II at 3000 as far as digging into the pattern. Didn't quite go as planned but trying to take away some things as a learning experience. I felt like I never had a good look till last game and half when I was playing deep, crossing 25 at the arrows fading my Code Black out. The mids blew open fast. There was more friction at the end of the pattern than I expected, so squaring up early was a challenge, but the out of bounds was very apparent, so bellying the ball too much playing around 2nd arrow needed some really good accuracy. I think I left the 2-8-10 three times in the first 2 games. No Rules Pearl at 2k was a bit over/under. Phaze II at 3000 just didn't have the teeth too smooth out properly coming off the end of the pattern. Marvel Pearl at box with 40-50 games went 60 feet. Game 3 was a disaster. I moved in the follow transition, but people started in so much, I moved to their pair and then right into their friction. The Phaze II wouldn't get through the mids no matter what. That's when I moved another arrow and switched to the Code Black to finally have a look the rest of the block. I'm just questioning what I should have used the first 2 1/2 games before really having to get left of the friction in the middle. I also think if I felt more comfortable with it, I could have moved right and play the shim of oil that people never played on and the track. But that was a hella precise shot. Two boards right of target and you'll hit light with a split. Two boards left and you headpin. Thanks for taking the time to post the follow up. My son got to practice on this and then bowl on it again for his league. Using the notes we took the first time he bowled it, decided to hit his Alpha Crux with a worn 500 abarlon pad. Worked well first game. Started getting squirrelly part way through the second game. Looked at the notes and I suggested to him to move in and throw pretty much up 10 with his IQ Tour. He thought I was crazy. It’s where he ended the first time he bowled it in league. Worked perfectly. Got to the 8th frame of the third game. He wasn’t happy with the way the ball was going through the rack. But it was still getting to the pocket. I suggested he try his Hy Road. Huge difference. It drove through the pins. So had a game plan for his league. Starts with Alpha Crux and starts with front 5, tap, then a couple of missed targets. 222. Stuck with the Crux too long in the second game in my opinion. Carry went away. Finally switched to the Hy Road. Ended up with 780 for 4. First and only other time on the pattern, 675. So a nice improvement. He was first seed. Had an ok two games in the bracket, 172-204=376, but the kid he was bowling couldn’t miss, carried everything. I think he hadn’t moved for enough left with his feet for those two games. Was getting to the pocket, but not enough carry. Going to an IQ Tour on a sports pattern is the opposite of crazy. That ball can carry you when you are lost like few others. That said hell yeah on the Hy-Road. He didn’t think it would make the turn to the pocket, until I pointed out to him that’s what he did the first time. Trying to drive home the importance of taking notes for each tournament/league and pattern.